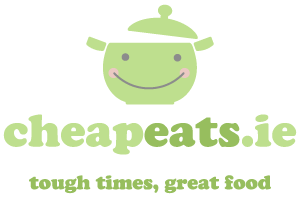 I know a lot of people can be reluctant to give lentils a go at all, especially if they’re not familiar with vegetarian food. But I’ve yet to meet someone who didn’t enjoy puy lentils when they tried them. I serve this with my favourite mash – sweet potato. 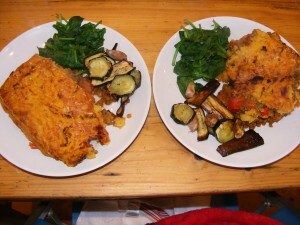 It works equally well with Celeriac Mash, a very creamy recipe for which you’ll find on iFoods.tv. I find the most important thing with mash is to make sure that the uncooked chunks are the same size, so they all cook evenly. Cottage pie was always a childhood favourite, even though we were raised to call this minced beef based “Shepherd’s Pie”. I was traumatised a few years ago to discover I’ve never eaten Shepherd’s Pie, which uses minced lamb – but my Mum is not backing down! If you’d like a meat-based Cottage Pie, I like Nigel Slater’s version, which uses red wine to make a gravy. This serves two greedy men, or three regular folk. It will take just over an hour to prepare, but most of that is simmering and cooking time, so you can read or watch TV. You can make this a day in advance, or make extra and freeze it. I’ve broken down my Aldi receipt and reckon it cost just over €5 to put this together, or €6 when I add the amount of lentils I used from a 500g bag. Not bad at about €2 per very generous portion of really tasty and healthy food. It’s substantial enough to serve alone, but I wanted to use up some spinach (which I wilted) and aubergine and courgette (which I chopped, tossed evenly in olive oil, sprinkled with Maldon sea salt and black pepper, and roasted for about half an hour). Peel the sweet and regular potatoes, chop, and place in seperate pots or bowls water. Boil the potatoes for about 5 minutes. Then add the sweet potato and cook both for about another 10 minutes, or until tender. When they feel tender with a fork or knife, they’re done. Toss in the puy lentils, toss for two minutes until they are well coated in oil. Add the tinned tomatoes and the vegetable stock, bring to the boil and simmer for around 30 minutes or until lentils are cooked. After 20 of these minutes, add in the chopped fresh herbs. If the mix is getting a bit dry, add more stock. When the sweet potatoes and potatoes are done, mash together with the milk, cream, and butter. Spoon the lentil mixture into an overproof dish, and top with the mash, which should be cold by now. Grate fresh parmesan over the mash topping. Cook for 20 minutes at about 180 degrees Celsius/ 350 Fahrenheit/ Gas Mark 4, until the top is crispy and golden, with juice bubbling over the sides. Love the look of this. Definitely on the menu this week. Big fan of puy lentils. 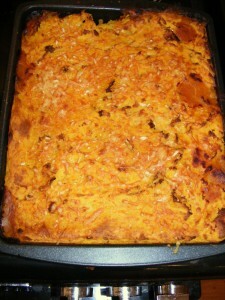 @Spudnik Sweet potatoes are easy to use and delicious. Tried a great chorizo stew with chick peas and sweet potatoes over Xmas break (more in it than that, obviously), but was a delicious dish.